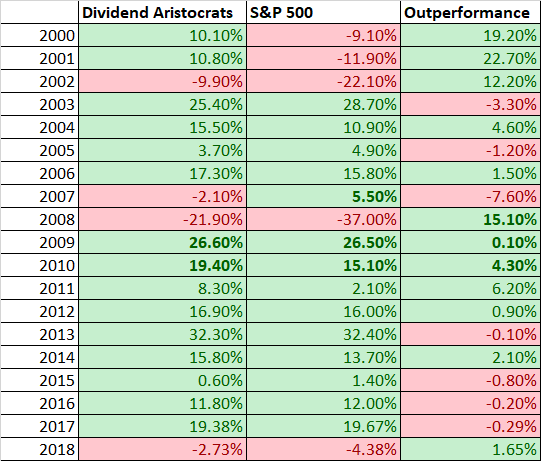 The Dividend Aristocrats are a select group of currently 53 S&P 500 stocks with 25+ years of consecutive dividend increases.These 53 are large, US companies that have historically provided (slightly) better performance and (slightly) lower volatility than the S&P 500 as a whole. C.R. Bard (BCR) was removed from the Index after it was acquired by fellow Dividend Aristocrat Becton-Dickinson (BDX). Please note that Praxair Inc. is to be acquired by Linde. 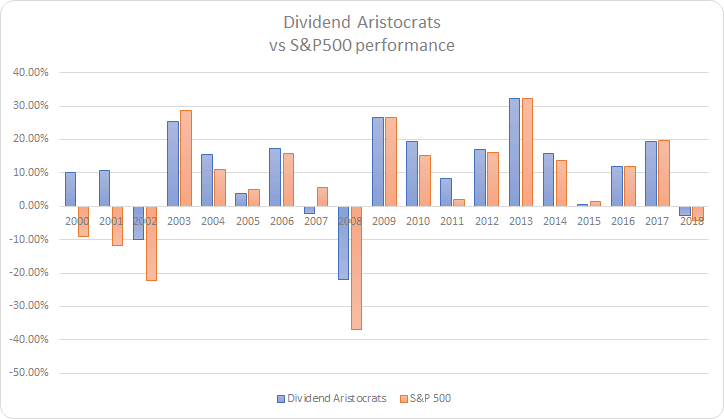 The S&P Dividend Aristocrats Index has outperformed the S&P 500 over the past decade. According to S&P, Dividend Aristocrats generated an annualized return of 13.70% over the past 10 years, easily beating the market’s 12.40% rate. Over this period, dividends accounted for 31% of the market’s total return. For the year 2018 the performance is -2.73%. See below the chart as of December 31,2018. Since the 2000, the dividend aristocrats outperformed the S&P500 in 60% of the cases with an average difference of 8.08%. Taking the under-performance in to account the average out-performance is still 4.2%. The last diagram (below) shows the performance per holding period. The performance/yield triangle shows the average annual returns for any investment periods, ie combinations of buy and sell times on an annual basis. The “year of buy” is plotted on the horizontal axis and the “year of sell” on the vertical axis. The average annualized return can be seen at the intersection of these two coordinates. For example, those who acquired the dividend aristocrats at the end of 2000 and sold them at the end of 2002 achieved an average annual return of -0.08%. With an exit in 2003, however, a per-annum return (cagr) of 7.78% is calculated. The average data in the bottom indicate which average annual yield was achieved at the start of the respective year. Starting with a position in the aristocrats at the end of 2000, Dividend Aristocrats (buy&hold) investors made e.g. average annual price returns of 8.07%. Next to the MDD, also the performance is important during the recession. 20 of the dividend aristocrats managed to realize an overall positive return over the 2007-2009.